Rise in customized and hybrid EMBA programs in US will drive the demand for EMBA in future and the introduction of EMBA programs in more colleges will affect the US Executive MBA market positively. According to Ken Research report titled “US Executive MBA Market Outlook to 2022 – By Structured and Customized and by EMBA and GEMBA Programs” introduction of more customized and hybrid programs and students inclination to opt GEMBA program will be the key growth catalyst in future. It is projected that there will be 7.2 million international students worldwide by 2025 in which 70.0% will be Asians. The US federal government has introduced various types of initiatives and programs to increase student transfer from one nation to another. These policies include initiatives to attract international students to the US and encourage American students to study abroad, as well as bilateral and regional agreements to spur mobility specifically to and from key partner countries or regions. Mirroring the landscape in other parts of the world, policies and programs to attract international students to the US include scholarships, visa-related initiatives, and “study in”- type efforts. The business schools have been increasing their fee per year by a certain percentage which has made a positive impact on the EMBA market. With increase in the fee, a trend of incline in the annual packages of the EMBA program has also been observed in the country. EMBACs exit survey 2017 showed that the graduates received increase in compensation having high ROI. 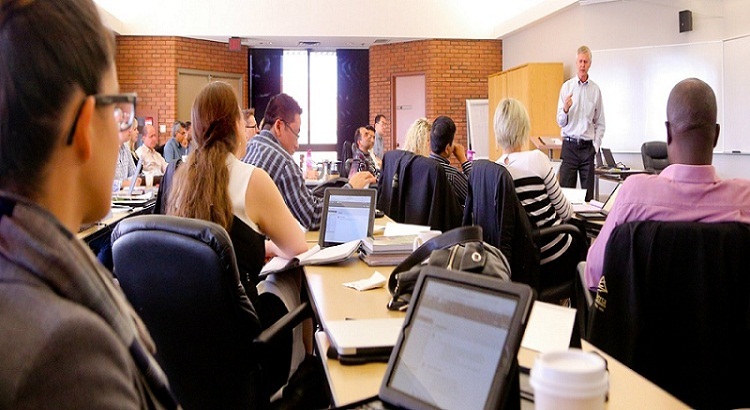 The US executive MBA schools have been developing blended pedagogy programs for the curriculum delivery. Various B-schools have launched programs with various virtual platforms over the years. For instance, UNC’s Kenan-Flagler Business School reformatted its evening and weekend executive MBA programs by incorporating virtual classes over a LMS platform. In 2013, the college re-launched both of its programs with digital content delivery over virtual platform. The blended format has been complementing its on-campus sessions with videos, simulations and discussion boards. The students in the Presentation Skills course can upload individual presentations to the class page for feedback from classmates before the next in-person session. It has been anticipated that demand for executive MBA will increase in industries undergoing significant change which tend to have the largest demand in upcoming years. Industries undergoing such change include the converging space of IT, entertainment, media, sports and energy. Other changing industries include those with a dramatically shifting supply chain and those with significant new regulatory requirements such as E-commerce, Deep Tech sectors.